Automated Drive and Design provides a low-cost and effective solution for mounting vision cameras and peripheral equipment in the roughest of environments. AD&D Mounts provide multiple articulate positions. A device used to hold an object, such as work that may be manipulated to any position within its mechanical limitations. Used primarily where an object is to be held, or positioned, in a permanent position for a long period of time. 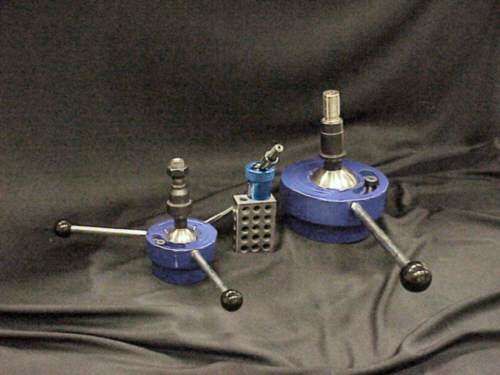 Mechospheres™ have all of the same articulating features as our power actuated Serospheres™. 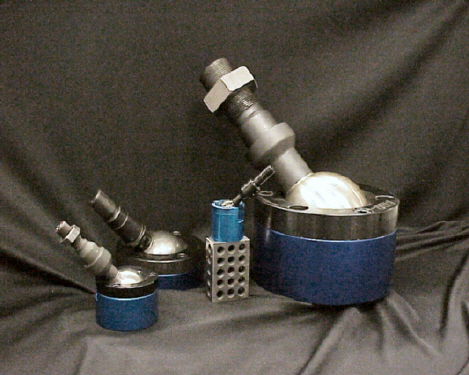 Mechospheres™ were designed to be work holding devices to reach the "hard to get places". Their application is limited only by your imagination. Once a position is obtained, three lock bolts should be tightened to hold the ball and post into position. 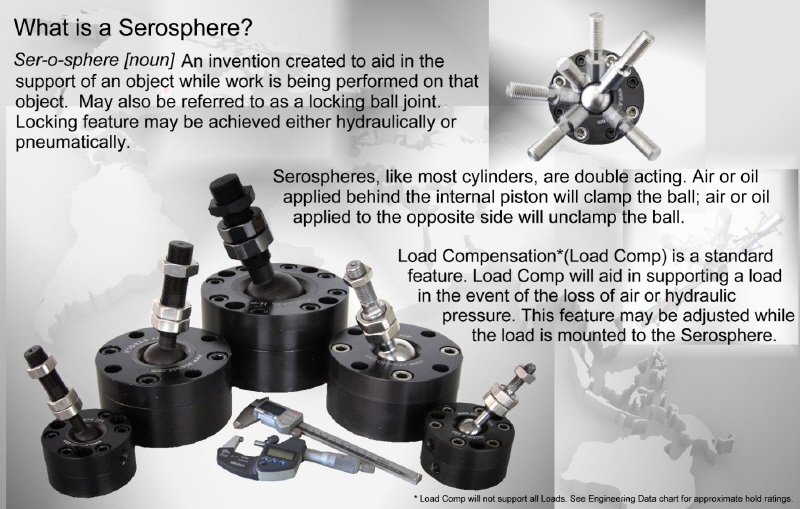 Mechospheres™ are intended to be used infrequently, such as where the final position may remain indefinitely or without frequent use. Position locked by tightening bolts. 1", 2", 3" and 5" models available. A positioning device, or manipulator, that is used to hold a material object while work or process is being performed to that object. Used wherever frequent changes in position is required. A handle (or handles) is used to loosen or tighten the sphere for repositioning of work. Note, the 1" model has a knurled ring rather than handles. 1", 2", and 3" models are available. 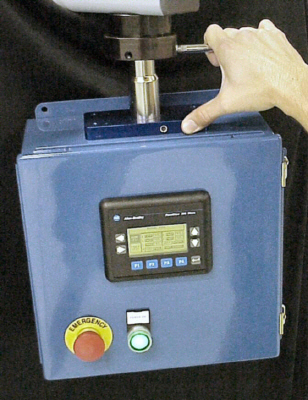 A device to which one would mount a Man-Machine Interface (MMI) to aid in easily positioning and repositioning as operators change from one position to the next, such as a shift change. There is a 1” diameter hole to the center of the ball is provided for wire runs. 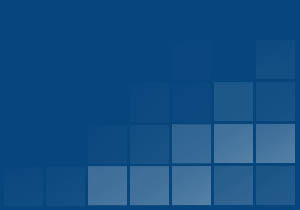 Panelspheres™ are designed to support operator interfaces. They are a ball & socket design that allows the ball to rotate within the socket. It moves a total 60° when rotated about the center of the ball. A handle is provided that may be placed in one of three positions. The ball clamp may only be loosened enough to move the panel to the desired position. A safety bolt is provided to limit the travel of the clamp. Automated Drive and Design offer a complete line of well engineered articulated arms. All of their arms are equipped with pneumatic cylinders that act as a counterbalance to support your work objects. Four models are available, they are: The 505, 506, 507, and 508. One of the 507 models and the 508 model are available with rod lock cylinders to prevent accidental dropping, in the event of air loss. They all offer a wide range of articulation. Various lengths of forearm reach is available on all models except the 505. Articulated arms are an ergonomic tool that are a must in today's industrial environment.